Initially, I thought it was a time management problem. But, after pondering things for a while, I realized it was a bigger issue. Too much was changing: products, buying cycles, the economy, technology, competitors. Customers expected more. They wanted you to continually bring them ideas, insights and information to help them be more successful. To stay at the top of your game, you needed to always be learning – but when? Your calendar is already full. It was literally impossible to keep up at the same time you needed to meet your numbers. No wonder every seller I talked to was in overwhelm – and worried about making their quota. For those who’d just taken a new sales position, the challenge was even greater. 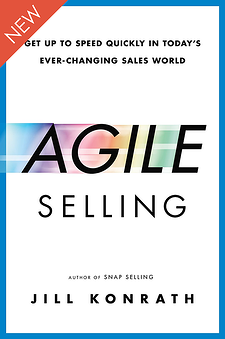 So … that’s why I wrote AGILE SELLING. It’s all about the mind-set, skills and habits you need to get up to speed quickly and rapidly adapt to changing conditions. Get your copy today. There’s literally no risk in doing so. If, after reading/listening to it, you think it wasn’t worth it, let me know and I’ll personally send you a check. Me, not Amazon or BN. I guarantee it’s worth your time.